27-Oct-2006 -- On 24th of October, 2006, Mr. Damiran.G and myself (Mr. Soninbayar.P), drove from Ulaanbaatar to Sukhebaatar province of Mongolia. We were scheduled to work at the Baruun-Urt city’s Hospital for 3 days to perform maintenance and service on their Ambulance’s VHF/HF communication system. This was of course our main objective. The work was completed quickly finishing a day earlier than scheduled. Our second objective was to visit a new confluence point at N46E114. I had measured the distance between the Hospital and confluence point using Google Earth and it was 94 km. The hospital authority agreed to join us on our journey to the N46E114 point and perform checks of the Ambulance communications system. The journey to confluence point was conducted on 27th of October, 2006 in our Toyota Land cruiser and Hospital’s Ambulance, a Russian jeep which is equipped with VHF/HF radio communication system. We lost VHF communications at 64th km and then switched to HF communications. We needed to install a 10m long wire antenna on the ground to make contact with 103 (call sign of ambulance center). The drive to the N46E114 point was not very difficult. The terrain was rather flat without too many obstacles such as hills or sand dunes. We arrived at the N46E114 point at about 1:00pm. On the way we did stop a few times to stretch and enjoy a taste of vodka and whiskey. The air was so fresh! This was noticeable because I had not visited the countryside in a long time. 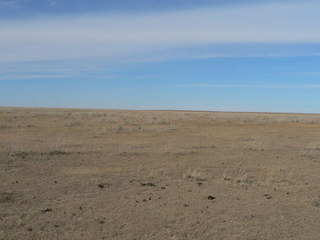 We have planned a visit to the Southern Gobi desert province of Mongolia next week. We hope to come back with a couple of new visits to confluence points.